Website owner who are estimating e-commerce solutions, there are different suitable options for holding websites & shopping carts. It doesn’t matter which option you select, finalizing on a design introduces with it even additional decisions to make. Undoubtedly a custom design is always a choice but for those who prefer to keep costs down, templates are recommended option. 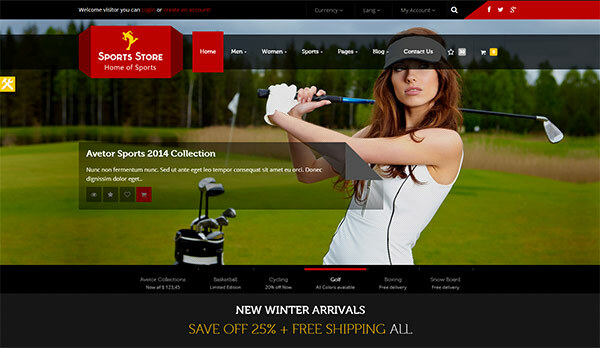 Sports store is elegant, clean responsive ecommerce HTML5 & CSS3 theme best for sports stores, health products, sportswear and similar websites that needs supportive rich inspiring presence online. 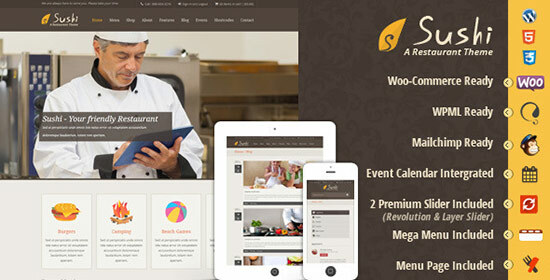 This is usually created by using HTML5 with an absolute responsive design that makes it perfect for all devices. 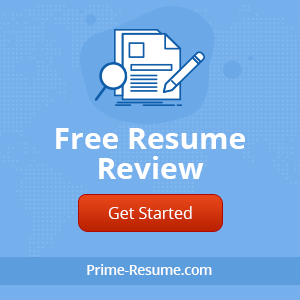 This comprises different features like Google Web Fonts, PHP contact form, PSD layer included, CSS based dropdown navigation, 20+ page templates & much more. This is a real eCommerce Glamour & trendy HTML with combination of inspiring images & colors makes website more attractive, elegant, luxurious, glamour and glossy for buyers. This template is suitable for modern design template, valid HTML5 & CSS3, 6 home pages, 2 types catalog, includes 31 Layered PSD files and Bootstrap Grid is used. 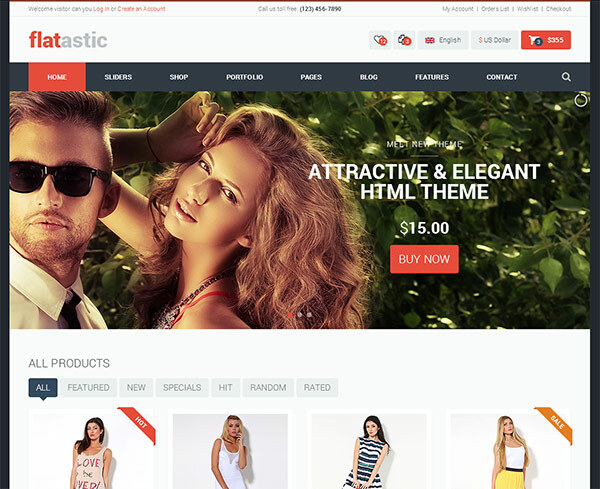 Flatastic is an exclusive premium HTML5 template that is preferred for e-commerce. It will amazingly best for any kind of online store because of its ultra-modern, elegant and multi-functional layout. The variety of type layouts, footers & header will make the website development procedure more attractive & flexible. 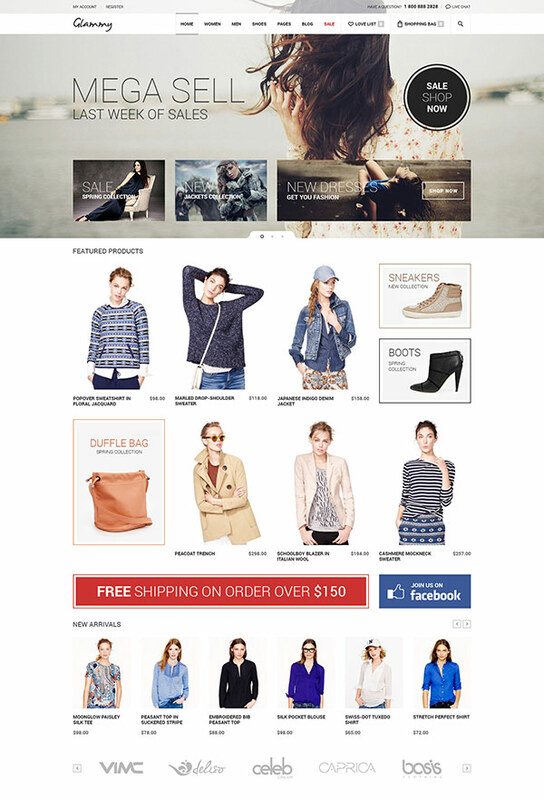 Pear is 100% responsive ecommerce HTML template. It consists upon Bootstrap v3.0.3. The template is redesigned with trendy look and completely user-friendly & eye catchy so may people using it to get best from their website. Zeon is the specific solution for an eshop, ecommerce website, online catalog or any other concerned project. You can utilize different features from this template like responsive design, elegant, clean, modern and stylish transition effects, all ecommerce features, social media integration like Facebook, Twitter and much more. 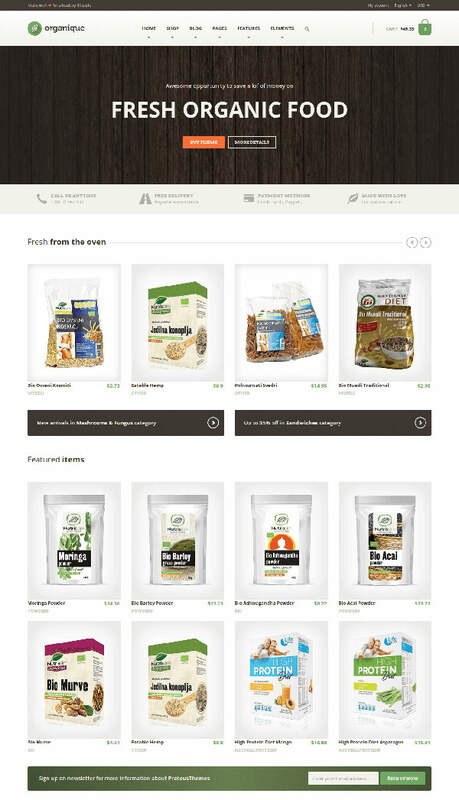 This is a premium HTML template for organic, healthy, natural food shop, eco or any related local business website. This is easy to manage and you can manage its setup easily as its responsive & retina ready, search engine optimized, unlimited layers & colors, Layered PSD, 290+ Glyphicons and Zocial Icons, lighting fast & Advanced shop filters. 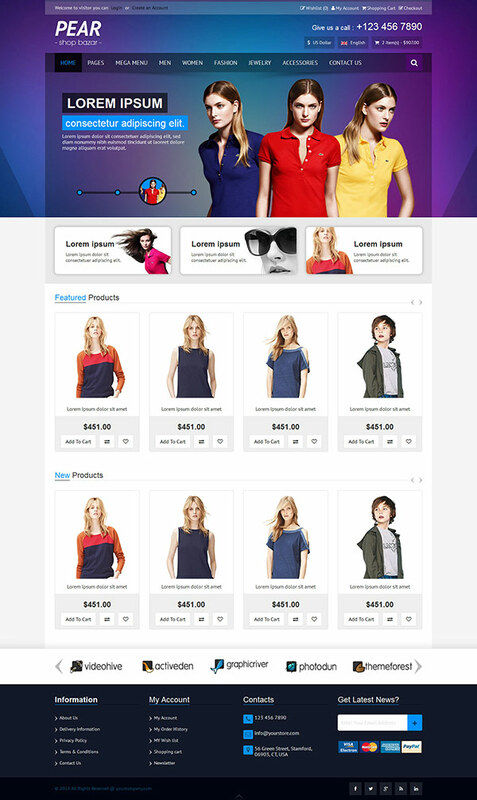 This is best for online shop website, it is the New Flat shop HTML template. The design is superb in impression, ultra-modern and also simple to customize. Children store is an elegant responsive ecommerce HTML5 & CSS3 theme best for children stores, kids product, kinder garden, baby shop and related website that require aspiring online presence. This is based upon Twitter Bootstrap along with a fully responsive design that makes best for all devices. 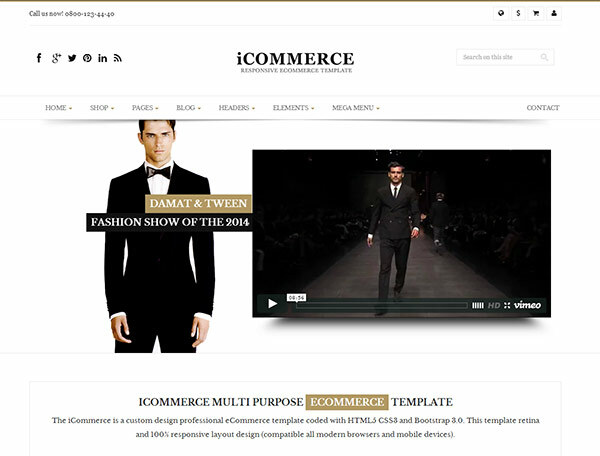 iCommerce is the most latest new responsive & retina HTML5 CSS3 ecommerce template. This is completely compatible with Bootstrap 3.0 having a professional look and some absolute friendly features that makes website most stylish. This creates complete working pages that give best impression just in few minutes. Bella is an amazing quite elegant responsive HTML5 template specially focused for restaurants, food businesses. This comprises various factors like testimonials, products, reservations, blog, pages, pricing table, menu, gallery and millions of short codes to create food business website just in few minutes.